Cell phone technology, particularly the inner working parts, are getting better and better with each new release. But for the most part, despite variations in screen size – some getting big enough to be considered baby tablets – the latest designs have all been relatively the same: rectangular and thin, with touchscreens that primarily account for most of the front of the phone’s real estate. A new patent submitted by LG would change that: giving you more screen space without having to lug around a phablet-sized phone. But it seems that back in 2010, LG came up with a phone concept and filed for a patent; according to Ubergizmo, the company was recently awarded that patent that describes the specs for a smartphone that has not one, not two, but three screens. 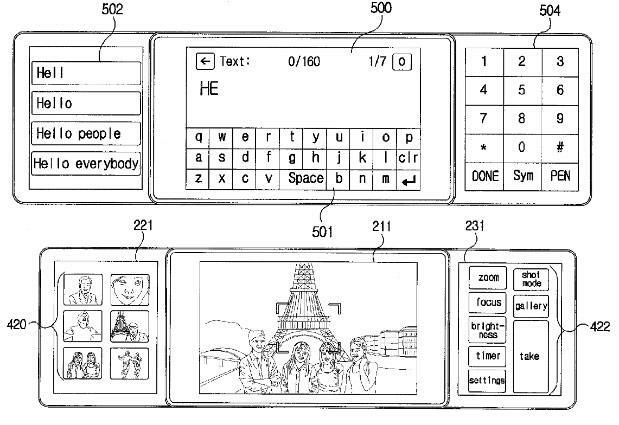 Looking at mock-up sketches that were included with the patent application, the phone would have one main screen and two additional that would be able to slide in or out of the phone as needed. It’s a pretty interesting concept, indeed. How might this benefit people? For examples, users could take a photo and not have the main screen covered with various actionable icons. Instead, the settings would be found on one side, while – based on the sketch – a gallery of recent images could be on the right. And smack dab in the middle is the uncluttered display showing what the final image would look like based on your selections. We’re not sure how this would impact the thickness of the phone. (Likely, it wouldn’t be as thin as the new cell models.) But it would definitely reduce the screen size – when in single screen mode – and help it slide into your pocket a whole lot easier.